Buying movies through different services just got a lot less complicated thanks to a new 'Movies Anywhere' initiative that combines your splintered film library. This means you'll now have access to a single library of movies if you buy them (or bought them in the past) through Google Play, Amazon, iTunes and Vudu. Best of all, Movies Anywhere is device and platform agnostic. It works across iOS 11, Android, Amazon Fire, Roku and Chromecast. What do you have to do to merge your movie library? Downloading the Movie Anywhere app or logging into the new website is all it takes to bring them all under one virtual roof. Movies Anywhere solves the annoyance of downloading a movie to a platform like Amazon, for example, and then realizing that you can't easily watch it on a specific TV or set-top that doesn't have the app (like Apple TV 4K at the moment – we're still waiting for that long-promised app). Even if both the movie and service are available to you, finding out which service you bought on a specific movie from was always an issue. Cycling between the apps to figure out "Which store did I download The Matrix from again?" was a chore. Finally, if you see a movie for a cheaper price on Amazon vs iTunes, say when all of those Black Friday and Cyber Monday deals happen next month, you can shop around. "I prefer Amazon, but... it's cheaper on iTunes..." Stop right there. Movies Anywhere just solved your first-world problem. Having one place for almost all of your movies sounds much more consumer friendly, and it's an idea that comes from Disney, which previously pushed its cross-platform Ultraviolet program. However, while Movies Anywhere works much the same way, it involves more major studios: Disney, Fox, Sony Pictures, Universal and Warner Bros.
All of these companies are finally increasing ease of use when it comes to watching their movies. Why? Well, for one thing, Netflix has become known for addictive binge watching, ease of use and its own original content (that doesn't involve anyone from Disney to Warner Bros). That's a threat. With a total of five key studios backing the same idea Disney had three years ago, having access to a giant digital movie locker is finally ready to become the norm, not the exception. To start things out, Amazon and other services are offering five free movies so you can test out the expanded Movies Anywhere service. 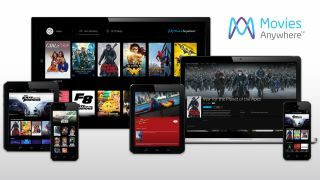 All you need to do is connect two or more accounts through the Movies Anywhere app in order to download these movies for free. This single-library strategy is a nice incentive for consumers who may be wary of buying movies because they're siloed to one platform and one account. Starting today, with Movies Anywhere and thanks to the the benefits of Family Sharing, online movie purchases don't seem so limiting.